Friday January 22 1909 I was busy with the work all morning. I went to town in the afternoon to get medicine for both myself & Will I was not gone long. There was two things of interest in tonights paper. One was Fred Stevens engagement to Effie Thompson and the other was the death of Will Lichty Saturday January 23 1909 I did not do much house-work. I finished the tatting for Mrs Hazard and began some for Mrs Smith. I am reading some in an interesting book I got down home. Sunday January 24 1909 I did not go to church but did the work and read a little, and got the dinner over so I went down town at 12.12. I met John & Hattie and we went to Mr Lichtys funeral at The Lutheran church. The services were impressive and the church full of people. I came home at 4.30 and after supper read in my book. I hear John Hart in Chicago is very sick. 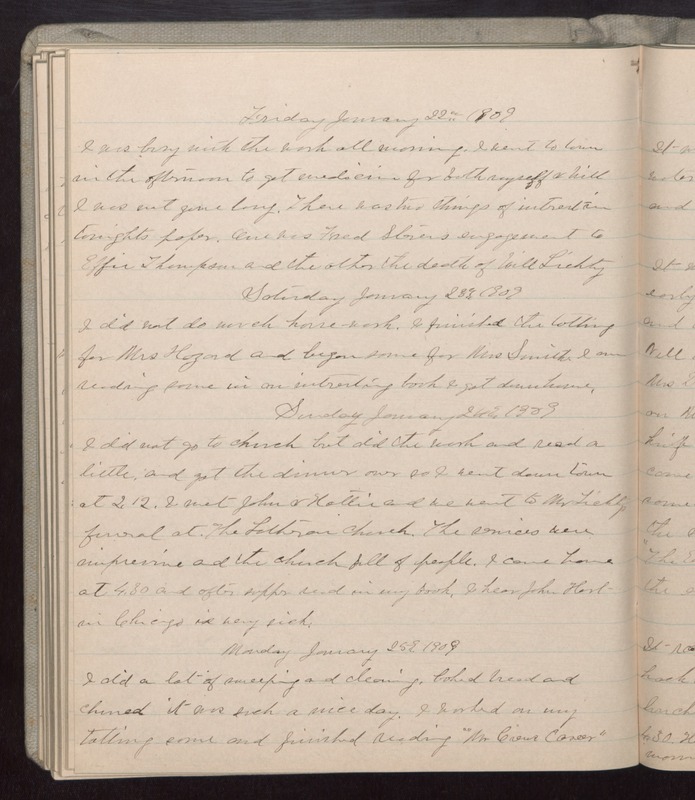 Monday January 25 1909 I did a lot of sweeping and cleaning, baked bread and churned it was such a nice day. I worked on my tatting some and finished ready "Mr [Crews?] Career".